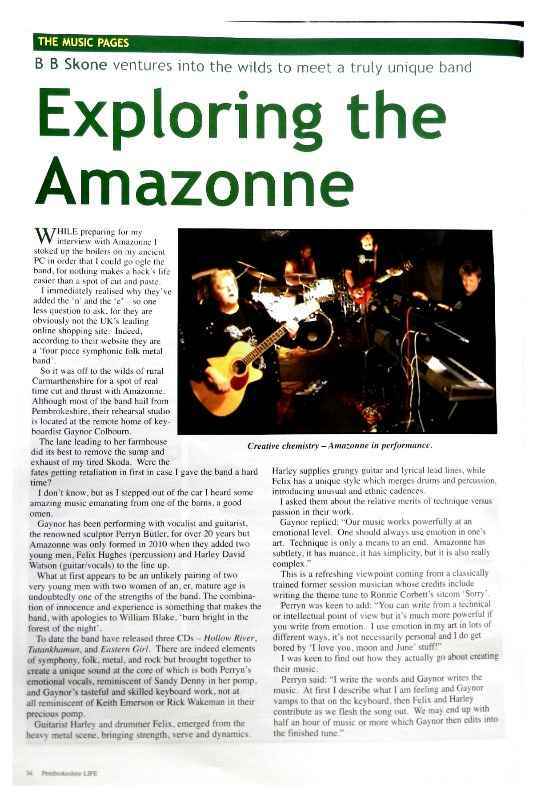 Perryn and Gaynor re-formed the successful folk rock band, Amazonne, in 2010,and are playing concerts and festivals. Along with aHolly Robinson on Fiddle, Tom Bryant on drums and percussion, Matt Collins on guitar and Mike Forwood on Bass, Amazonne is a very full and unique sounding band. 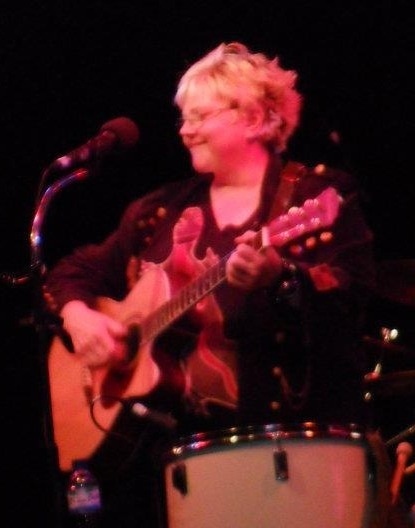 Perryn not only sings, and plays the guitar, she is also a really mean Bodhron and mandolin play. Gaynor plays the keyboards, but not one, not two, not three, not even four, but six keyboards and a proteus and waveform. The recent aquistion of hers is the PHENOMANAL Korg M3 Keyboard, which is simply outstanding. She has 9 foot pedals which means she can bring sounds up and down, its too much to describe. She really has often been described as a keyboard Wizard. Gaynor, though less well known than keyboard wizards like Rick Wakeman and Keith Emerson, is up there with them, a keyboard great. This band has subtelty, it has nuance, it has simplicity, but it is also really complex. 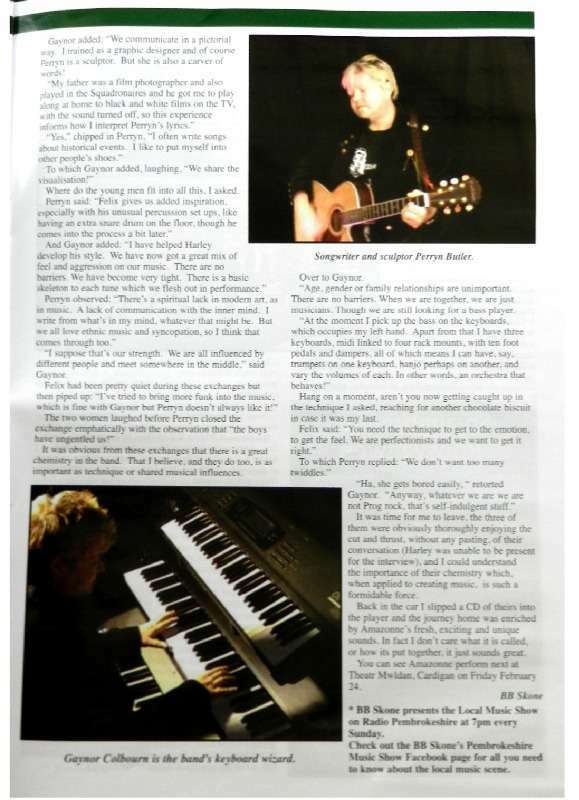 At a London concert a while ago, the review in the music press on Amazonne stated that they were as unplugged as Pink Floyd !!! The songs that Perryn and Gaynor have written over the last 25 years, cover so much emotion and yes, aggression as well. Gaynor, who for many years was a session musician is more than competant in all styles, and toured for many years in a heavy rock band, and also composed music for TV and Film. It always amuses us, but the general attitude of the populous, is that all the best writers and performers are male, and that females lack 'balls', when playing. Many years ago, at a gig in Basingstoke of all places!!! 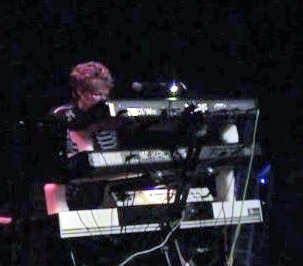 Gaynor had set up, at the time four keyboards, and several MIDI linked rackmounts and pedals. A young man was heard saying to his companion, as he looked wistfully at the keyboards, ' What a waste, all those keyboards being played by a GIRL !!!!' After a performance which left the crowd shouting for several encores, the young man was heard saying to the same companion, 'I told you they'd be brilliant !'. He then asked Perryn and Gaynor for their autographs. Oliver is a very sensitive guitarist who plays across the styles of music introducing the heavier side of Amazonne's music with his metal technique. 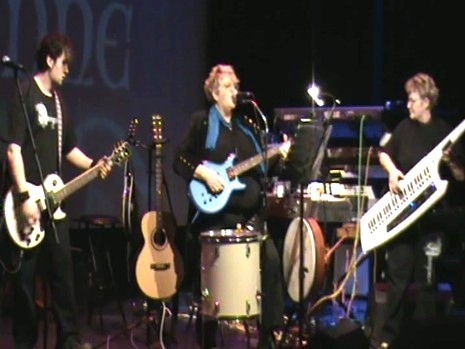 As a younger member of the band, Ollie is still discovering the joy of playing in a band like Amazonne, and is continuing to bring different textures into the music. He loves to be visual, and on stage he is very compelling to watch, his Italian good looks beguiling the audience. Holly is an inspirational fiddle player who's early years were classical, but now she plays across the board, folk, rock and even sometimes, Metal fiddle. Her Tom Phillips Octave fiddle gives her the range of a cello, which adds a new dimension to the music, as do her phenomonal solos and counterpoint. She works alonside both Ollie and Mike, working sometimes in unison, sometimes weaving in and out, giving the band a unique sound. Tom is drummer and percussionist, and is a very visual performer, who brings a visual element to the band, as well as a musical input. he has brought a new subtlelty to the band, but also the ability to use his technique to enhance and drive the music. The drum set up he has allows him to play drums and percussion at the same time, using a floor snare, in conjunction with a huge percussion set up, doumbek, bongos, djembe, gong and piccolo snare. Mike is a very talented, solid and intuitive bass guitarist, using a 6 string bass, he plays lyrical bass lines giving Amazonne a very melodic bottom end. He and Bob work closely together giving Amazonne their distinctive depth. Amazonne Folk Celtic Fusion Band.